Metaiodobenzyl guanidine (MIBG) is a derivative of guanethidine and acts as an analogue of nor-epinephrine and is widely used in the imaging of tumors of neuro-endocrine origin. Iodine-123 MIBG has ideal imaging characteristics but is expensive with limited availability. Iodine-131 MIBG is widely used in India and is cheap. 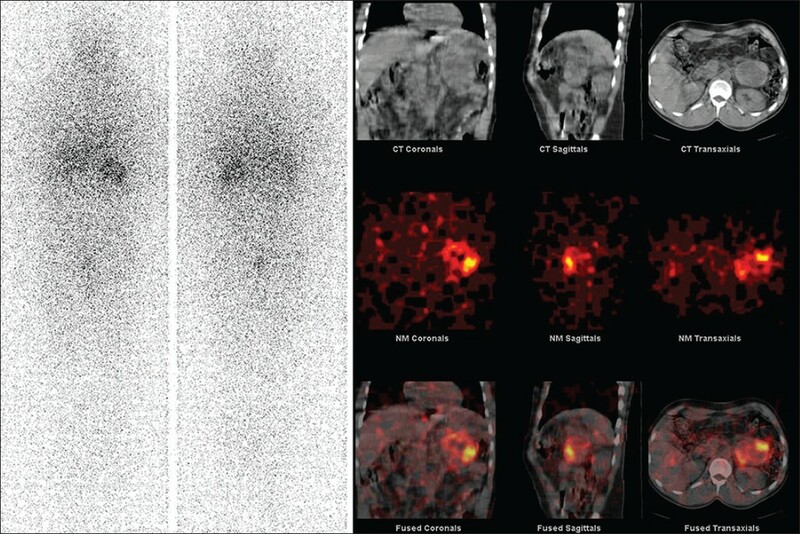 Hybrid single photon emission computed tomography (SPECT)/computerized tomography (CT) allows for anatomico-functional imaging and is being tried in MIBG studies. However, the experience with I-131 MIBG is limited. 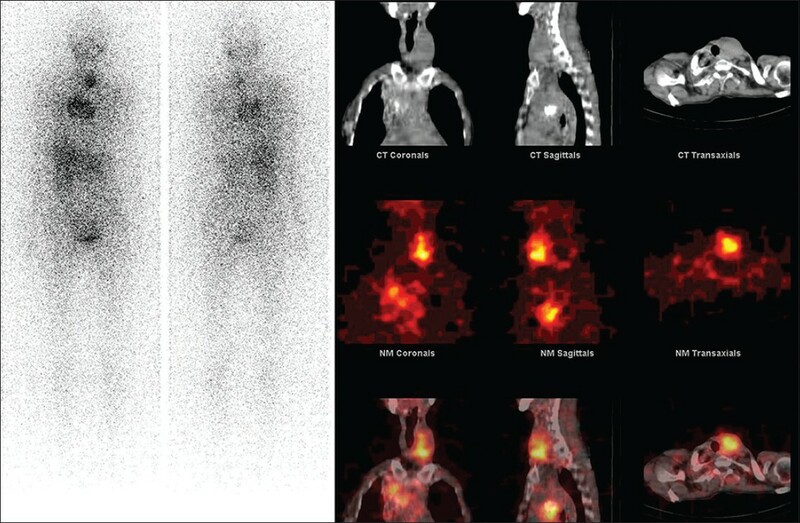 We present a pictorial assay of I-131 MIBG SPECT/CT findings in various MIBG avid tumors. Metaiodobenzyl guanidine (MIBG) is a derivative of guanethidine and acts as an analogue of nor-epinephrine. Therefore, it is concentrated in the sympatho-adrenergic tissues, especially in the chromaffin tissue of the adrenal medulla. Uptake of MIBG is both by passive diffusion and active uptake. Cellular uptake of MIBG is followed by uptake in intracellular storage granules facilitated by vesicular monoamine transporters. MIBG is labeled with either Iodine-123 (I-123) or Iodine-131 (I-131). 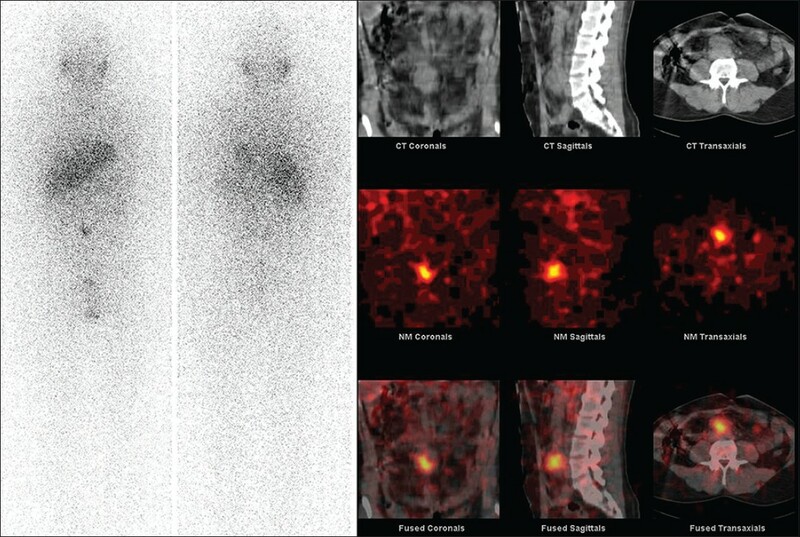 Even though I-123 labeled MIBG is the radiopharmaceutical of choice for single photon emission computed tomography (SPECT) and in pediatric patients owing to favorable photon energy and lack of beta radiation, the availability of this radiopharmaceutical is limited especially in India. Most centers in India continue to use I-131 MIBG due to its lower cost and ready availability. Use of I-131 MIBG is complicated by high energy photons and beta decay which leads to sub-optimal imaging properties and higher radiation dose to the patient. I-123 MIBG is a very important investigation in management of children with neuroblastoma and has been shown to have sensitivity of about 90% and specificity close to 100%. I-131 MIBG is used as a therapeutic option in patients with advanced neuroblastomas. Approximately 60-70% of the carcinoids are visualized with MIBG. Better results are obtained for tumors originating from the midgut, whereas only 11% originating from the foregut are visualized with MIBG. Higher MIBG uptake is observed in concomitance with the elevated serotonin levels. Medullary thyroid cancer shows variable avidity to MIBG with one study  showing a sensitivity of 38.7%. Lower sensitivity is because of very small size of the lesions. 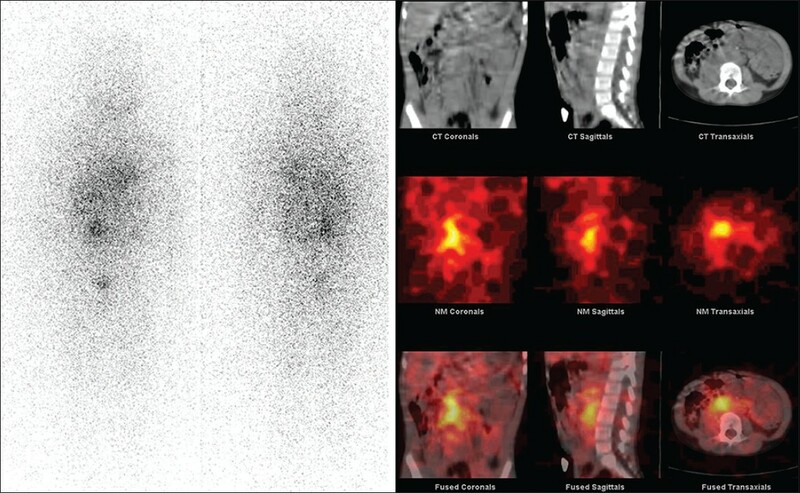 In spite of the lower sensitivity, MIBG avidity allows for radionuclide therapy of this rare malignancy. 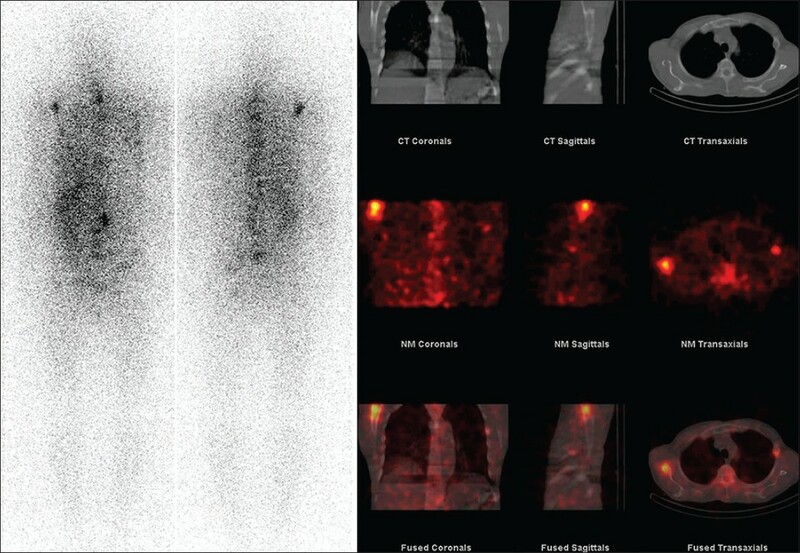 The availability of hybrid SPECT/single photon emission computerized tomography (CT) has allowed for fusion imaging. Few studies have elaborated the role of SPECT/CT in MIBG studies ,,, but the experience with I-131 MIBG SPECT/CT is limited. I-131 MIBG is the only choice in countries where I-123 MIBG is unavailable. 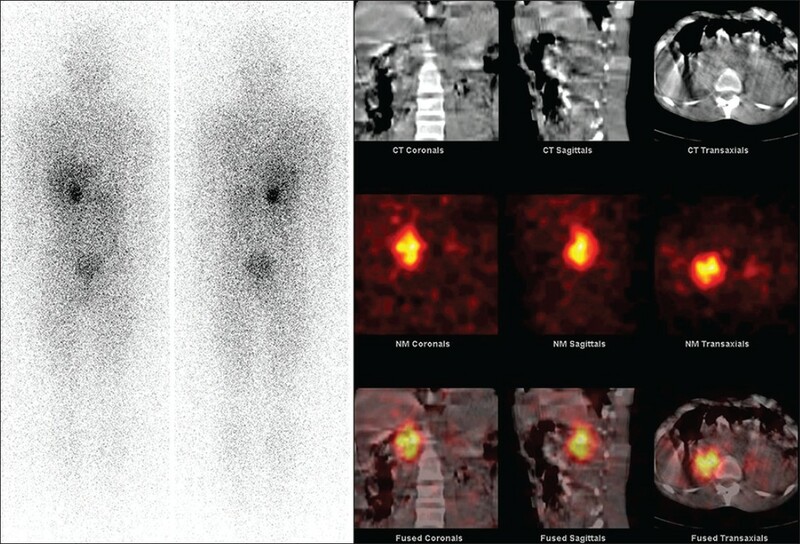 I-131 MIBG SPECT/CT patterns in various MIBG avid lesions are pictorially depicted in this study. Scintigraphic images of 11 patients [Figure 1], [Figure 2], [Figure 3], [Figure 4], [Figure 5], [Figure 6], [Figure 7], [Figure 8], [Figure 9], [Figure 10] and [Figure 11] who underwent Iodine-131 MIBG are represented in this pictorial essay. All patients underwent whole body scinitigraphy and hybrid SPECT/CT images of the involved sites. Whole body images were acquired 48 h after intravenous injection of 0.5 mCi to 1 mCi of iodine-131 labeled MIBG (I-131 MIBG). Patients were asked to discontinue any medication interfering with I-131 MIBG uptake before the study. Patients were administered syrup collosol iodine (25 ml/day; 8 mg/5 ml) the day before and 4 days after I-131 MIBG injection to block thyroid uptake of any free iodine. All images were acquired in Infina Hawkeye 4 SPECT/CT scanner (GE Healthcare, Milwaukee, USA) fitted with a medium energy general purpose collimator. The whole body images were acquired at a speed of 10 cm/min. SPECT images were acquired in 64 × 64 matrix, in a step and shoot method covering 360 degrees in 60 views and 30 s per view. Following the SPECT acquisition, CT was acquired in helical mode and tube current of 2.5 mA covering the involved area. Images were transferred to Xeleris workstation and were evaluated. Hybrid SPECT/CT images were examined by evaluating the individual SPECT images, CT images and the fused SPECT/CT images. 1. Jaques S Jr, Tobes MC, Sisson JC. Sodium dependency of uptake of norepinephrine and m-iodobenzylguanidine into cultured human pheochromocytoma cells: Evidence for uptake-one. Cancer Res 1987;47:3920-8. 2. Bombardieri E, Coliva A, Maccauro M, Seregni E, Orunesu E, Chiti A, et al. 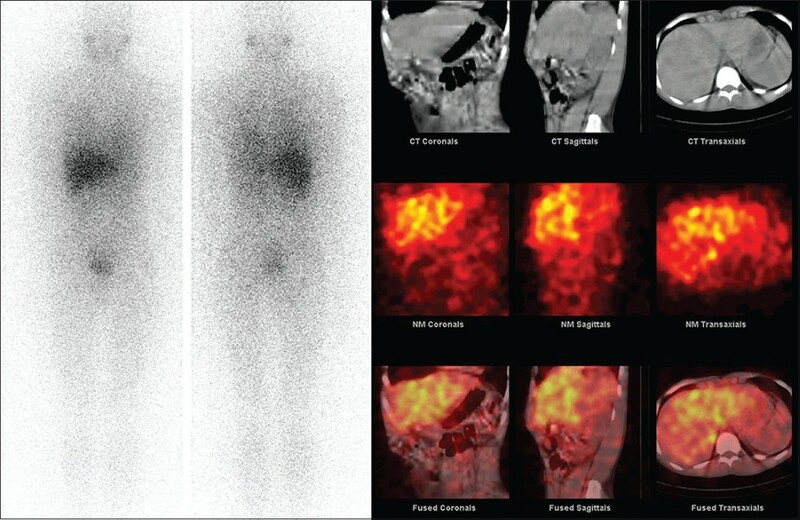 Imaging of neuroendocrine tumours with gamma-emitting radiopharmaceuticals. Q J Nucl Med Mol Imaging 2010;54:3-15. 3. McEwan AJ, Shapiro B, Sisson JC, Beierwaltes WH, Ackery DM. Radio-iodobenzylguanidine for the scintigraphic location and therapy of adrenergic tumors. Semin Nucl Med 1985;15:132-53. 4. Shapiro B, Copp JE, Sisson JC, Eyre PL, Wallis J, Beierwaltes WH. Iodine-131 metaiodobenzylguanidine for the locating of suspected pheochromocytoma: Experience in 400 cases. J Nucl Med 1985;26:576-85. 5. Valk TW, Frager MS, Gross MD, Sisson JC, Wieland DM, Swanson DP, et al. Spectrum of pheochromocytoma in multiple endocrine neoplasia. A scintigraphic portrayal using 131I-metaiodobenzylguanidine. Ann Intern Med 1981;94:762-7. 6. Shapiro B, Sisson JC, Lloyd R, Nakajo M, Satterlee W, Beierwaltes WH. Malignant phaeochromocytoma: Clinical, biochemical and scintigraphic characterization. Clin Endocrinol (Oxf) 1984;20:189-203. 7. Boubaker A, Bischof Delaloye A. Nuclear medicine procedures and neuroblastoma in childhood. Their value in the diagnosis, staging and assessment of response to therapy. Q J Nucl Med 2003;47:31-40. 8. Castellani MR, Seregni E, Maccauro M, Chiesa C, Aliberti G, Orunesu E, et al. MIBG for diagnosis and therapy of medullary thyroid carcinoma: Is there still a role? Q J Nucl Med Mol Imaging 2008;52:430-40. 9. Khan MU, Morse M, Coleman RE. Radioiodinated metaiodobenzylguanidine in the diagnosis and therapy of carcinoid tumors. Q J Nucl Med Mol Imaging 2008;52:441-54. 10. Sisson JC, Frager MS, Valk TW, Gross MD, Swanson DP, Wieland DM, et al. Scintigraphic localization of pheochromocytoma. N Engl J Med 1981;305:12-7. 11. Sisson JC, Shulkin BL. 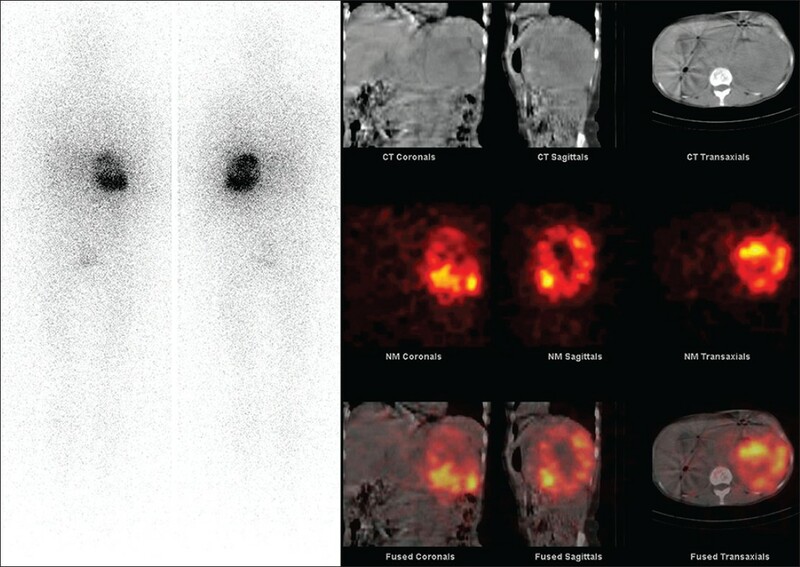 Nuclear medicine imaging of pheochromocytoma and neuroblastoma. Q J Nucl Med 1999;43:217-23. 12. Furuta N, Kiyota H, Yoshigoe F, Hasegawa N, Ohishi Y. Diagnosis of pheochromocytoma using 123I -compared with 131I -metaiodobenzylguanidine scintigraphy. Int J Urol 1999;6:119-24. 13. Bhatia KS, Ismail MM, Sahdev A, Rockall AG, Hogarth K, Canizales A, et al. 123I-metaiodobenzylguanidine (MIBG) scintigraphy for the detection of adrenal and extra-adrenal phaeochromocytomas: CT and MRI correlation. Clin Endocrinol (Oxf) 2008;69:181-8. 14. Eisenhofer G. The role of neuronal and extraneuronal plasma membrane transporters in the inactivation of peripheral catecholamines. Pharmacol Ther 2001;91:35-62. 15. Boubaker A, Bischof Delaloye A. MIBG scintigraphy for the diagnosis and follow-up of children with neuroblastoma. Q J Nucl Med Mol Imaging 2008;52:388-402. 16. Tang HR, Da Silva AJ, Matthay KK, Price DC, Huberty JP, Hawkins RA, et al. 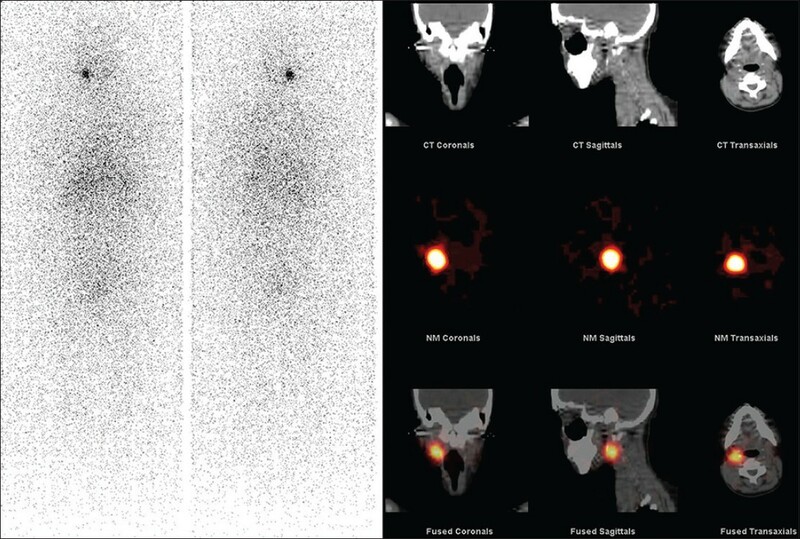 Neuroblastoma imaging using a combined CT scanner-scintillation camera and 131I-MIBG. J Nucl Med 2001;42:237-47. 17. Rozovsky K, Koplewitz BZ, Krausz Y, Revel-Vilk S, Weintraub M, Chisin R, et al. 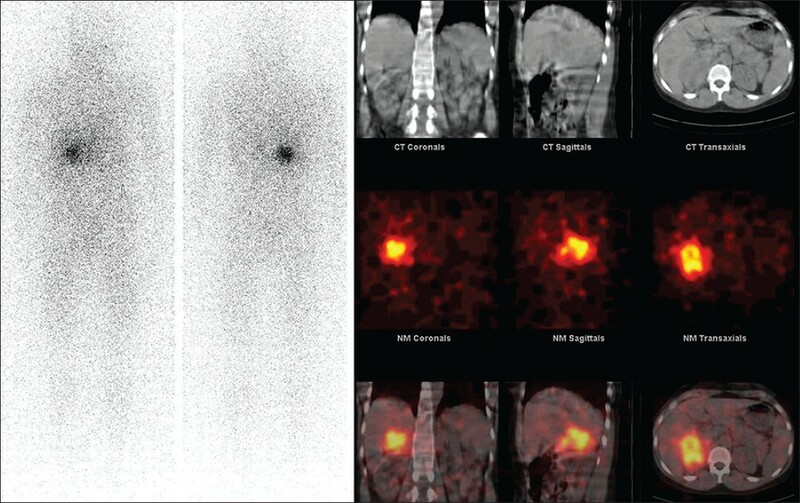 Added value of SPECT/CT for correlation of MIBG scintigraphy and diagnostic CT in neuroblastoma and pheochromocytoma. Am J Roentgenol 2008;190:1085-90. 18. Meyer-Rochow GY, Schembri GP, Benn DE, Sywak MS, Delbridge LW, Robinson BG, et al. 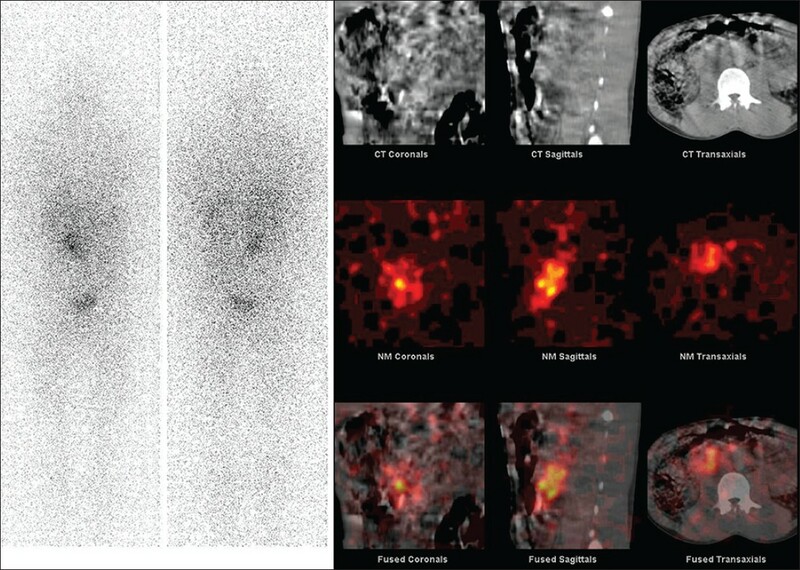 The utility of metaiodobenzylguanidine single photon emission computed tomography/computed tomography (MIBG SPECT/CT) for the diagnosis of pheochromocytoma. Ann Surg Oncol 2010;17:392-400. 19. Fukuoka M, Taki J, Mochizuki T, Kinuya S. Comparison of diagnostic value of I-123 MIBG and high-dose I-131 MIBG scintigraphy including incremental value of SPECT/CT over planar image in patients with malignant pheochromocytoma/paraganglioma and neuroblastoma. Clin Nucl Med 2011;36:1-7.